A biomarker is a biological feature that are used to measure the biological state, presence of diseases or progress of effects of treatment. It helps in understanding various chronic diseases, its effects on exposure to certain environmental conditions and also in identification of people who are at high risk of developing the same disease being diagnosed. The demand for CNS biomarker has increased with the development of in proteomics, genomics and imaging system, which is a major drivers of the Global Central Nervous System Biomarkers Market. The global CNS biomarker market is witnessing a moderate to high growth in the recent years and is expected to continue so on in the near future. The global CNS biomarker market is expected to reach up to $ 6.2 billion by 2022 growing at 10.4% CAGR during 2016-2022. The major factors identified that are driving the CNS biomarker market are support from private players and government for increased research and development, development of genomics and imaging system, rapidly increasing aging population and increased public private partnerships. Recently, FDA has approved use CNS biomarkers which has led to its significant growth in the North American region. The world is experiencing a significant growth in aging population. As per Administration for Community Living, population aged 65 and above is estimated to reach more than 80 million by 2050, which is twice of that estimated in 2012.This growth in aging population is leading to increased development of many CNS disorders like Parkinson’s, Alzheimer’s disease and multiple sclerosis. As per the Aging Research Center, approximately 24 million people are affected with Alzheimer’s disease globally. Governments are supporting and funding private and public laboratories to overcome this research and development program across the country. In addition, technological advancements and innovations, development of new applications areas, increasing lifestyle oriented diseases etc. are few factors which are likely to spur the demand of global CNS biomarker market. . Nevertheless, the increasing demand of personalized medicines, large untapped market in emerging economies of APAC and favorable government policies are the few opportunities area for the global CNS biomarker market. 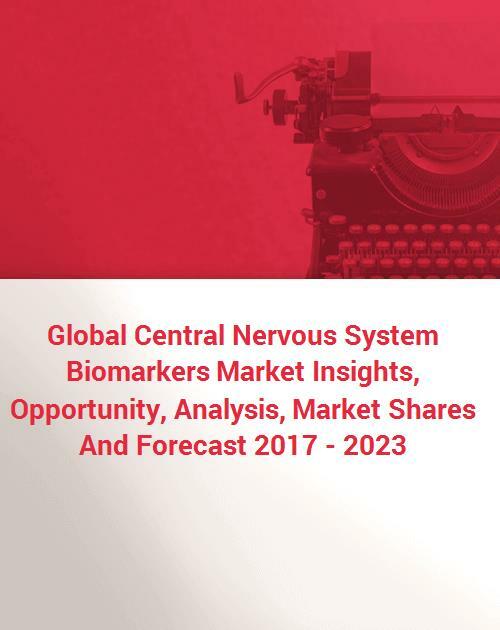 The Global Central Nervous System Biomarkers market is segmented on the basis of type, applications and end users. On the basis of type the market is segmented safety biomarker, efficacy biomarker, predictive biomarker, pharmacodynamic biomarker, prognostic biomarker and validation biomarker. On the basis of application it is segmented as diagnostic development, drug discovery and development, personalized medicine market, disease risk assessment market and other market. In the application segment personalized medicine market is expected to have a significant growth due to its increasing demand by patients. The end-use industry segments comprise the Hospitals, eye clinics, diagnostic centers and patients. The major regional segments analyzed in the report include North America, Europe, Asia Pacific, and Rest of the World with further bifurcation of them on country level, which includes U.S, Canada, India, China, Japan, Germany, U.K., Spain, Brazil etc. Asia Pacific is anticipated to be one the fastest growing market in the global CNS biomarker market. The major reason for high growth is wide customer base in the region, improving healthcare infrastructure, purchasing power of buyers and increasing government initiatives. However at present, North America has the largest market share in global CNS biomarker marker because in the region healthcare infrastructure is more advanced than any other and also because of increasing ageing population. For instance, according to the U.S. Census Bureau approximately 20% of the U.S. population is projected to be 65 years and above by 2030. Some of the key market players are Abiant Inc., Acumen Pharmaceuticals Inc., Alseres Pharmaceuticals Inc., Apitope International, Aposense, Avacta Group Plc, Banyan Biomarkers, Diagenic ASA, EKFDiagnostics Holdings Inc., Enzo Biochem Inc., Exonhit Therapeutics, Genenews Ltd, Great Lakes Neuro Technologies, Innogenetics Biological, Innovative Neuro Technologies Inc., Metabolon Inc., Myriad RBM Inc., Oligomerix Inc., Opko Health Inc., Proteome Sciences Products, Psynova Neurotech Ltd, Ridge Diagnostics, Sabiosciences, Satori Pharmaceutical Inc. And Thermo Fisher Scientific. Expansions, Mergers & acquisition and collaborations for product development are the key strategies adopted by the market players to sustain in the market also companies are applying for patents for any new product they develop. In January 2016, D Banyan Biomarkers into an agreement to develop and commercialize hand held blood test to evaluate and detect concussions. With this collaboration Banyan Biomarkers will be able utilize its knowledge of bio molecules responsible for neurological injuries and take an advantage of Philips’ strength in handheld diagnostic and patient monitoring technologies. Similarly in February 2014, in a deal of $270 million cash Myriad genetics acquired Crescendo Bioscience. By this acquisition Myriad will be able to use Crescendo Bioscience’s Vectra DA test which is used to measure level of disease activity in a patient suffering from rheumatoid arthritis. 3.1.1. Development in Proteomics, Genomics And Imaging System Has Increased Demand for CNS Biomarker.